The Who - Stand and Deliver! At the time of writing this blog, I had no idea – that is to say, no recollection – that I’d already come up with some of the song titles some months earlier in reply to someone who commented on the initial Whotles-related blog. I only discovered it now in the process of copying the URL of that blog for a publicist who has just announced the Who’s latest Aussie tour! Who knows – I may have even inspired the e-bayer. A while ago I spent some time ruminating on the best course of action for the Who and the Beatles, seeing as the former band have lost their original drummer and bass player, while the latter are down to their drummer and bass player. Make way, then for the Whotles: Roger Daltry, Pete Townshend, Paul McCartney and Ringo Starr. In the same little blog entry, I suggested that it were far more likely that the pushy, bass playing, mutual back-slapping, musical genii of the Beach Boys and the Beatles would join together first: Brian Wilson and Paul McCartney of the Beachles. Well, it seems someone else has liked that idea. 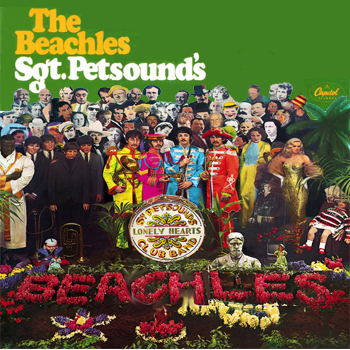 Make way for Sgt Petsounds, by the Beachles! If I were brutally honest, I’d be forced to admit that these mash-ups are quite heavy-handed compared to, say, The Grey Album by Danger Mouse (the mash-up of The Beatles’ so-called ‘White Album’ and Jay-Z’s Black Album). Sgt Petsounds is still a worthy undertaking nonetheless. Thanks to Michael Larson for pointing its existence out to me! …Your honesty is appreciated, but I'd like to point something out to you. I am friends with a good number of producers and DJs, and like me a great number of them feel as if the Grey Album is sub-standard. I could give you examples, and even show you just how little work went into the construction of those tracks. Many of them are one or two loops set to a simple beat, and there's hardly any Beatles material on the record. You even get the impression at times that Dangermouse doesn't much like the Beatles. Don't get me wrong... I do like Dangermouse's solo work, but this project of mine is a different sort of mashup record. I don't think of it as heavy handed, or a mashup record at all, in the sense that it is intended as an abstract reinterpretation, in the vein of Negativland, Emergency Broadcast Network, the Residents, and the like. Certainly some people have felt the way you do, though I dare say that it is really because we have grown to accept and even expect that which is most easily digested. This record is a challenge to make, especially since it's being done almost exclusively track for track, and it should be equally challenging to listen to. And anyway, it would be a disservice to the people who enjoy my original music if I were to lay a simple beat under all of it. Feel free to check that stuff out, but it's not for everyone. Okay... sorry for rambling. Very funny that we would cross paths! Take care. And so I’d like to add that I agree, Dangermouse’s Grey Album is simplistic in it’s approach, is beat driven, does resort to loops… and I realise that’s why I like it more than Sgt Petsounds — which I love in concept, much as I also like the Residents, but listen to their gorgeous, glorious noise quite infrequently. I do like my mashups easily accessible and beat-driven rather than avanguarde and harder to ingest, and Clayton clearly knows what he’s talking about here because, on the same site, he features a Paul McCartney & Wings Vs Ne-Yo mash-up that does tick all the traditional, on-the-beat, easily digestible boxes!